All plants and trees need water in order to survive. However, an overabundance of this element cannot only cause your plants and trees to die but ruin the whole landscape as well. This is why effective drainage systems are necessary to maintain the health and beauty of any landscape. Look for a license. Licensed contractors are wary about shady deals because they know that their licenses are at stake. Interview previous clients. Ask about their performance from past customers. This will give you an idea if the contractor of your choice can adhere to deadlines and create efficient landscape drainage. Interview the contractor. Does the contractor do a good job of explaining the issues and providing solutions? If he doesn't, walk away and find one who does. Seek for transparency. A good contractor gives you a detailed list and computation of the materials and services needed for the project. Knowledgeable and highly experienced drainage contractors are aware that the best drainage solutions are the ones that are tailored for the specific needs of your area. That's why we do an inspection before we make any recommendations and implement the final plan. Flooding is usually the result of improper drainage pipe installation, and is common for an old or foreclosed property. Previous owners or their contractors either installed substandard pipes or did not set up adequate catch basins. But we at Design West Landscape will ensure that such problems will not happen. We provide a comprehensive solution to all your drainage problems to keep your worries away. No driveway drainage problem can ever exist if the driveway is carefully planned and built. However, there are some cases where an improvement is necessary to prevent flooding, especially if the property is located in a low-lying area. To ensure that this will not happen in your driveway, we only install the right type of drainage, like subsurface drains. 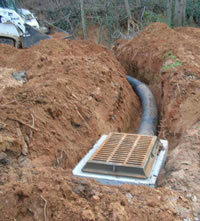 We also put a drainage grate to provide additional safety and prevent debris from falling and clogging your drainage. If you want beautiful and inconspicuous driveway drainage, go for permeable pavements instead. They get rid of water by absorbing it and returning it to the soil underneath. We can install surface drainage systems like downspout extensions, dry creek beds, deck drains, and channel drains in your yard. 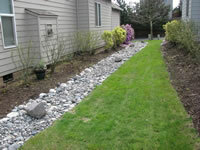 We can also add subsurface drains like French and mole drains to avoid clutter in your landscape. For 22 years, we have been providing excellent drainage solutions to the greater part of Northern San Joaquin Valley and East Bay area. In fact, we are proud members of the esteemed California Landscape Contractors Association. The secret to our success is our 100% dedication to all our projects and we always strive to do our best no matter how big or small they are. 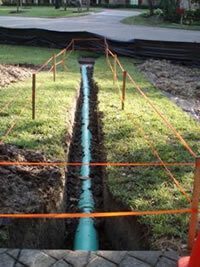 We avoid faulty drainage pipe installations by doing things right the first time. Rest assured that we only use premium materials and the latest tools and equipment to give you drainage systems that will add beauty, life, and value to your property.